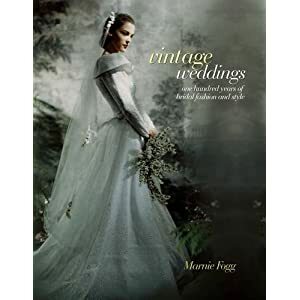 ‘Vintage Weddings’ is a new book by the Marnie Fogg, exploring inspirational wedding dresses through the ages in the form of a fabulous coffee table book. It is jam-packed with imagery to make you go ‘ooooh’ and ‘aaaah’, and I am sure you will find some inspiration in it for your own special day. The book is a visual journey through weddings over the past century, not only exploring the style of the dresses, but also the ceremonies, designers and cultural influences. Organised in a clear chronological order it is easy to flick through to find inspiration if you are planning a themed wedding. So if you are inspired by the belle opoque elegance of the Edwardian times, or thirties art deco, you will be able to find nuggets of information, including typical cocktails of the era, that will help you on your wedding planning way! Marnie Fogg is a media consultant in the fashion industry. She has lectured in Visual Studies and the Culture of Fashion at the University of Nottingham. She also has a Master’s degree in Art and Design Advanced Practice and Theory, and has a large number of books to her name. ‘Vintage Weddings’ is available to buy as hardback directly from the publishers, Carlton Books for £15.00 or from Amazon for £16.25 with free delivery in the UK.